Merry Christmas and an edible christmas wreath. Are you on Pinterest? If you’re not, better get onto it. It is amazing. Whether it’s scrolling through endless photos of Europe, cakes that are architecturally amazing, DIY ideas or wedding dresses, you can spend hours on it. A real time waster, that’s for sure. The food & drink board also provides a good understanding of why obesity rates in the United States may be so high. Cream cheese dips covered in choc chips, that you dip oreo cookies into. Or chocolate brownies with a whole Oreo and peanut butter inside. Unnecessary? Yes. Delicious? Absolutely. Anyway. Pinterest is also a good place to get inspiration for Christmas, and every now and then I get all festive and add to my christspo (christmas inspo. I like it, okay). Last year I came across this beauty. I had to do it. I quickly put my hand up to make a pavlova for Christmas day. Not that I had ever made a pav before, but whatever. It was all a little bit exciting really. But before you even think of getting the electric beaters out (or KitchenAid for those lucky enough), you must find the perfect christmas accompaniment. Michael Buble is good. I also hear Human Nature will do the trick. Next, line a baking pan with baking paper. I was lucky that my mum has a pav plate, which you can cook & serve on. No dropping or breaking ensured, and thus a less stressed Emma. Then, using a pencil draw a circle in the middle of the baking paper. 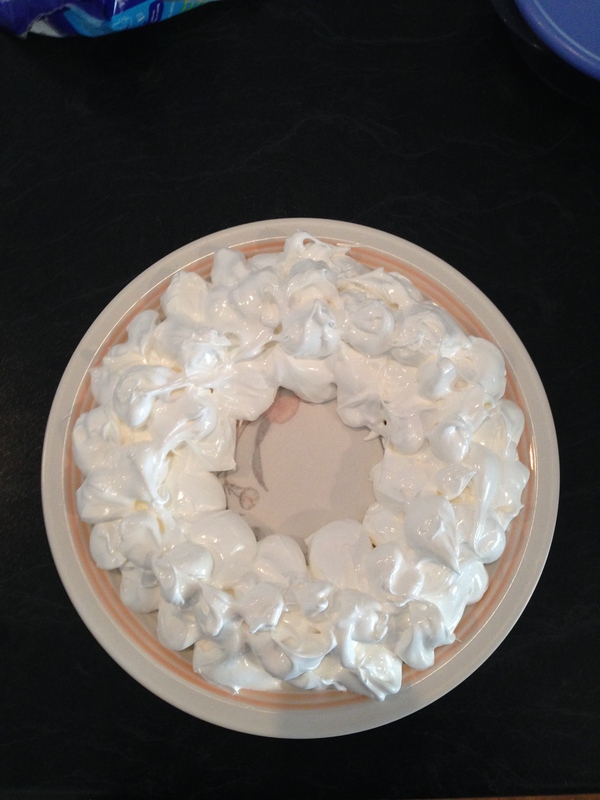 Make meringue as per recipe – I used 8 eggs. The place dollops of the mixture onto the baking paper. Keep in mind that it does expand, so don’t get too excited. In a small saucepan, I combined some frozen raspberries, a dash of sugar & water, and simmer on the stove. You could use orange juice too. Once it has reduced to a thick sauce, remove from heat and allow to cool. Next, whip up some cream and dollop on the top. Drizzle the raspberry sauce over the cream, and then place fresh strawberries, blueberries, raspberries & cherries. Then, locate some greenery. I cut a few leaves off some fake holly and place at the bottom to finish off your deliciously edible Christmas wreath. It really is super dooper easy, and your fam bam will love it. I’m thinking of changing it up this year. Maybe some grilled peaches and nectarines. Some mango too. With something vanilla-beany. Maybe. I’m on pinterest, so feel free to follow me. 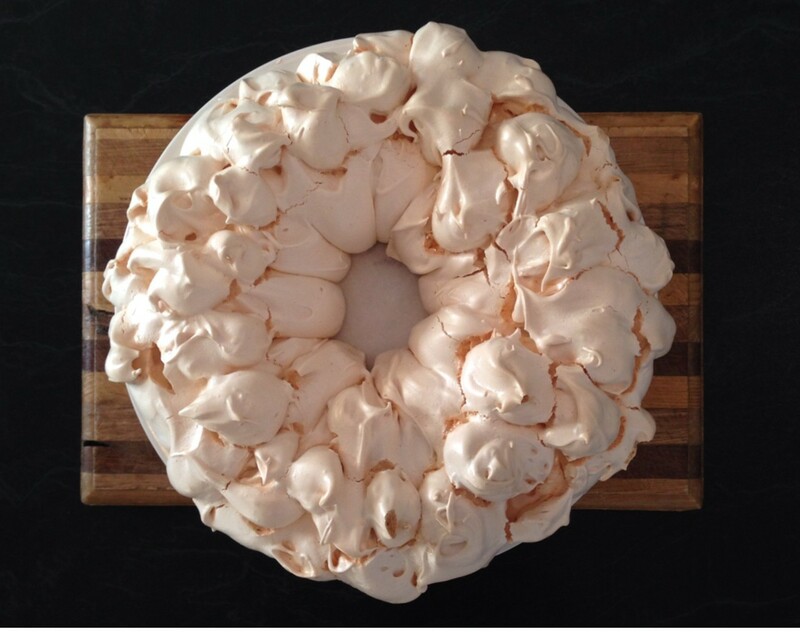 Also, let me know if you make this beautiful pav this Christmas. Tag me @emmajstubbs. Would love to see you getting into the Christmas spirit. In other news, it’s five sleeps till christmas. I would just like to say a massive thank you. Thank you to you for taking a few minutes out of your day to read my ramblings. Thank you to those of you that comment, share my posts or message me privately. I didn’t know where this blogging thing would go, or if anyone apart from my mother would read them. So I really do appreciate the support and it’s really nice to know that what I write is worth it. So, thank you. I wish you all a very merry christmas, and I hope you all have a wonderful time wining & dining with your friends and family. It really is a wonderful time of year. I also hope santa brings you a red KitchenAid stand mixer, or whatever else is on your wishlist. < Your right to remain silent: A step towards positive body image. Have a lovely christmas, and enjoy your mixer. Fingers crossed santa brings me a new food processor ! Pinerest is the freakin’ bomb! Certainly great Christspo, Foodspo, Fitspo Travelspo….